Hegerberg was making headlines again on Tuesday after becoming the first woman to win the Ballon d’Or (Golden Ball) award presented by France Football. She plays professionally for the French team Lyon, but all players from any country who have been active in European clubs are eligible to win. Those winning are considered by football journalists to have performed the best during the previous year. The Ballon dÓr has been awarded annually since 1956, with such stars as Lionel Messi and Cristiano Ronaldo being among the recent winners. Luka Modric from Croatia, who plays for Real Madrid, won the men’s award at the annual ceremony in Paris Monday night. 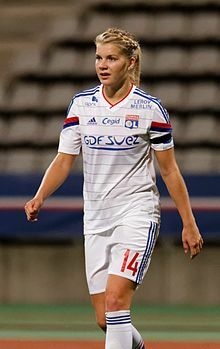 This year marked the first time the Ballon d’Or Féminin, or Women’s Ballon d’Or was awarded, making it an even greater honour for Hegerberg to be chosen as its first recipient. She didn’t let the program’s DJ ruin her evening either, when he controversially asked her to “twerk” (a dance style that involves shaking one’s rump). In classic Hegerberg style, the star football player known for being tough briefly stopped smiling, responded with a firm and simple “no” and turned away from him. He was later lambasted on social media, while Hegerberg was widely praised and he felt compelled to make a public apology. Hegerberg was otherwise thrilled to win the first Women’s Ballon dÓr, delivering a heartfelt acceptance speech in which she first thanked her family for all their support over the years, and then thanked France Football “for letting us have this opportunity” to also win such a prestigious award. She called it “a huge step for women’s football,” including in her “big, huge thank-you” her appreciation for all the work France Football put into the award. While Hegerberg praised France Football, she remains dissatisfied with Norway’s football federation. She dropped out of the women’s national football team last year after its poor results in the European Championships. She said the “fundamental” reason for her discontent, and anger, lay outside coach Martin Sjögren’s responsibility and mostly with Norway’s male-dominated football federation NFF. Lise Klaveness, a lawyer, TV football commentator and former football star herself, has since taken over as director of NFF. Hegerberg told Norwegian Broadcasting (NRK) that she has had some “good conversations” with Klaveness, but hasn’t changed her mind about turning down a spot on the national team. Asked whether the prospect of being able to play in the World Cup next summer wasn’t enough to tempt her back, she responded that “this isn’t about being tempted. It’s about a decision I’ve made that is independent of whether the national team wins matches.” She wished the team good luck in the run-up to the World Cup, still firmly believing that it’s the team that must accept her decision and her reasons for it. Klaveness congratulated Hegerberg with Monday night’s award, far from her first, and said NFF still wants “to have a dialog with Ada irregardless of the looming World Cup (for which Norway qualified without Hegerberg). We must try to understand the situation and keep the national team open for her.” She added however, that “it’s Ada who must make the decision.” For now, Hegerberg claims she’s very happy training with and playing for Lyon.